CANTON, MA (November 2, 2015) – It’s holiday time once again at Dunkin’ Donuts, and this year’s seasonal selection features three returning holiday coffee flavors, two new donut treats, and several sensational stocking stuffers to keep friends and family running on Dunkin’ through the end of the year. 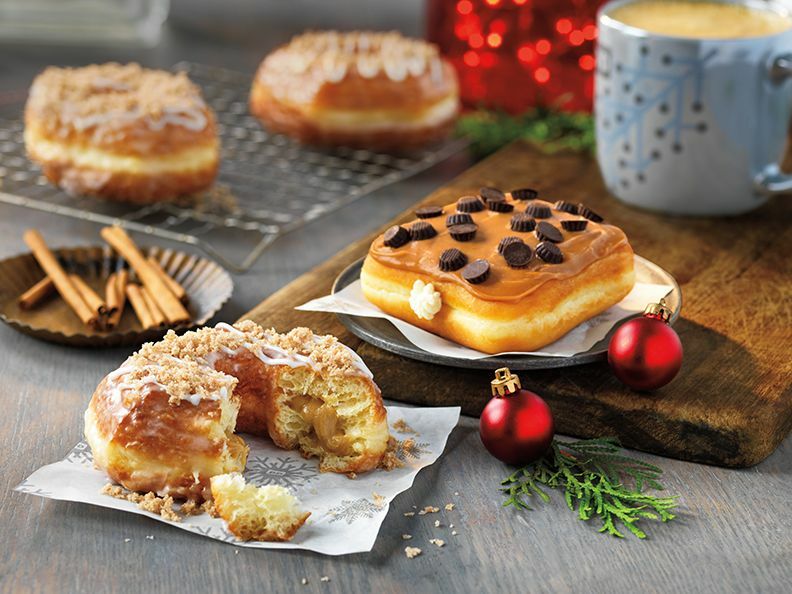 At the top of Dunkin’ Donuts’ nice list are delicious donut treats to ring in the holidays. The new Snickerdoodle Croissant Donut features a glazed croissant donut filled with cookie dough flavored buttercreme, finished with white icing drizzle and sprinkled with cinnamon streusel topping. The new Caramel Cheesecake Square is a square donut with smooth and creamy cheesecake filling, frosted with caramel icing and topped with chocolate caramel candy cups. Dunkin’ Donuts coffee lovers can enjoy some returning favorites this season with the festive flavors of a holiday baking favorite, as the brand has brought back two cookie-flavored coffees. Sugar Cookie Coffees offer the traditional taste of frosted holiday sugar cookies, while Snickerdoodle Cookie Coffees bring together the sweet taste of sugar and spice of cinnamon. Dunkin’ Donuts is also bringing back Peppermint Mocha Coffees to its holiday lineup, combining cool peppermint and rich chocolate flavors. All holiday beverage flavors are available all day long in hot or iced coffees, lattes, or the brand’s new Macchiato. Dunkin’ Donuts’ holiday menu items are available nationwide through the end of the year at participating Dunkin’ Donuts restaurants. For the perfect stocking stuffer for Dunkin’ Donuts coffee drinkers, Dunkin’ Donuts packaged coffee and K-Cup® pods are available this season in several varieties, including Original Blend, Dunkin’ Decaf®, French Vanilla, Hazelnut and the brand’s Rainforest Alliance Certified™ Dark Roast Coffee, and Hot Cocoa K-Cup® pods are available at Dunkin’ Donuts restaurants only. This year, as a fun new way to customize Dunkin’ K-Cup® pods, guests at Dunkin’ Donuts restaurants can purchase two 12-count K-Cup boxes in a special new Gingerbread House package. Also, a new K-Cup® Donut Box Variety Pack leverages Dunkin’s iconic dozen donut box, filled with 25 assorted K-Cup® pods for the special price of $19.99. Lastly, DD Perks® members can purchase two boxes of K-Cup® pods for only $14.99 at participating Dunkin’ Donuts restaurants through the end of the year. For another fun and affordable gift for anyone who runs on Dunkin’, Dunkin’ Donuts offers a host of holiday merchandise, including limited-edition branded holiday ornaments in five fun choices, including a Dunkin’ Donuts Ugly Christmas Sweater, a snowman, a holiday ball, a Dunkie Snow Globe and a box of the brand’s famous donuts. Dunkin’ Donuts also offers branded mugs, tumblers, gift baskets, and more. All are available exclusively at participating Dunkin’ Donuts restaurants nationwide, or online at www.DunkinDonuts.com. Finally, to help keep friends, family and co-workers running through the holidays and well into the New Year, Dunkin’ Donuts Cards are available in a variety of holiday and winter themed designs, including three new options: the Merry Mischief Card, the Mistletoe Card and the Igloo Card. Dunkin’ Donuts Cards can be purchased at any participating Dunkin' Donuts locations in amounts from $2 to $100, as well as online at www.DunkinDonuts.com and at many grocery, pharmacy, and big box retailers. Dunkin' Donuts Cards always have no fees and no expiration date.